Used in India as a powerful aphrodisiac. Believed to attract love, wealth, and protection. Used in magic since the middle ages. An herb with much history and value. The MOST powerful root one can possess in my opinion. Care, respect, and love nurtured this little being to bring you the most potent magic. You will find NO better quality herb. Extremely poisonous! In the Middle Ages, a Mandrake would fetch a high price. Small slices of the root would be sold to sailors to protect them on their voyages. Pieces would be sold to place over the entrance of a house to protect the home from fire and intruders. Pieces would be placed under pillows to The Mysterious Human-Shaped Mandrake Root promote dreams and under mattresses (particularly those of infants) to protect from nightmares. A complete Mandrake root would command a high price, and the more it looked like a human being, the higher was that price. But since the plant grew wild, those who made money from selling Mandrakes circulated stories about the problems of trying to obtain one straight from the soil, to discourage others from simply helping themselves. Since the Mandrake root looked human, it was said that it was alive and to take it from the earth was to tear it from its home. It would, therefore, give a terrible scream when pulled up. That scream was so terrible that it would drive insane the person who had tried to take it, or even kill with its shriek. There was, then, a special way in which one obtained a Mandrake. Needed were a hunting horn, a length of rope, a hungry dog, and a piece of meat. The Mandrake was said to grow beneath a gibber, feeding on the fat dripping from the hanged corpse. On the night of a full moon, the magician had to drop a noose of the rope over the Mandrake and then tie the other end to the dog's collar. He would then retire to a safe distance and throw down the piece of meat. 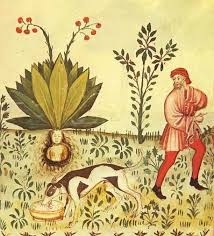 The dog, being hungry, would lunge forward to get the meat, pulling on the rope and dragging the mandrake out of the soil. At that point the magician should blow loudly on the horn to drown out the sound of the plant's scream. The dog would hear the scream and, allegedly, die instead. You will receive a 2x3 inch bag.